Forgotten Hollywood » Blog Archive » “Forgotten Hollywood”- Barrymore Gets Dramatic Makeover! “Forgotten Hollywood”- Barrymore Gets Dramatic Makeover! Chistopher Plummer is on a roll. After winning an Oscar last month, his next assignment is a two-person show exploring the life of John Barrymore. Plummer’s performance in 1997 on stage earned the acclaimed actor a Tony in 1997. <– John Barrymore is part of an acting dynasty. Known as The Great Profile, he was the brother to Lionel and Ethel, and a grandfather to Drew. He’s best known for the 1920s Dr. Jekyll & Mr. Hyde, the silent version of Sherlock Holmes, Grand Hotel, Dinner at Eight, Romeo and Juliet, Rasputin and the Empress, and Twentieth Century. The personal and professional life of Barrymore had a great influence on the careers of Douglas Fairbanks Jr. and Errol Flynn. While in a hospital in 1942, John’s last words were… Die? I should say not, dear fellow. No Barrymore would allow such a conventional thing to happen to him. He then closed his eyes for good. 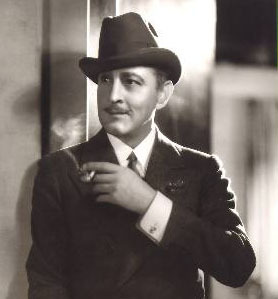 Barrymore was filmed over seven days on location, and on the stage at the Elgin Theater in Toronto. Last year, Christopher Plummer recreated his role for high-definition cameras. Producers say Barrymore will be released in Canada in May, and throughout the United States, Europe, Australia, New Zealand, South Africa, and other countries in October. This entry was posted on Wednesday, March 14th, 2012 at 2:23 am	and is filed under Blog by Manny Pacheco. You can follow any comments to this post through the RSS 2.0 feed. Responses are currently closed, but you can trackback from your own site.